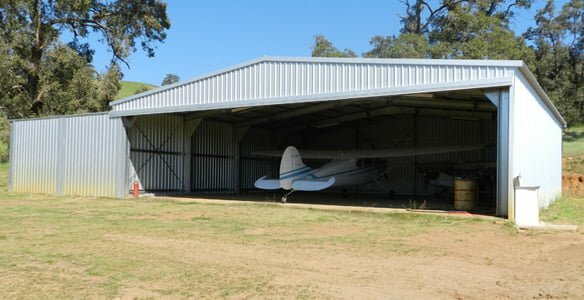 Of the many sheds we have erected around Perth, one of the most fun is the aircraft hangar. Aircraft hangars come in many sizes, from an individual helicopter hangar to a giant, commercial hangar at an airport. One of the main advantages to having a shed company erect an aircraft hangar as opposed to traditional construction is that you can save a lot of money. Sheds save a lot of money per square metre over traditional building and aircraft hangars take up a lot of square metres. Even a small hangar for a crop-duster or helicopter can be erected for thousands of dollars less from Action Sheds than traditional bricks and mortar construction. We would like to go over some considerations for erecting an aircraft hangar in different situations. If you are a small airport owner who wants to make more money and has extra space, an aircraft hangar may be a perfect revenue centre for you. If you are someone who wants to develop an aircraft hangar on leased land, this model can also work. We would recommend asking the following questions. Is there a demand for aircraft hangars? What are the rental rates for other hangars in the area? Is there a waiting list of hungry aircraft owners who desperately want aircraft hangars? How many aircrafts are in the area? Do you have competing airports in the area? If so, what are their rates for aircraft hangar rental? Does your competition have a waiting list? Once you have determined that there is sufficient demand, you then need to put together a cost analysis to see if an aircraft hangar would be profitable for you. Here are some factors to consider. If you don’t own the airport, how much would it cost to lease land? Does the airport require you to install taxi lanes or ramps? How much to equip your hangar with electricity and water? How much will your hangar cost? How much will it cost to erect the hangar? How much will you pay in taxes and fees? How much will financing cost? Can you expect to have full occupancy all year? If not, what will your vacancy rate be? If you don’t like the numbers involved in the owner-operator model or you just don’t have the time or energy to run a business, the condominium model is a great alternative. All you need to do with this model is develop individual hangar spaces with private access doors, then sell or rent them like condos. If you are leasing land from the airport, the terms can be negotiated with the owner. This will usually end up being a 25-30 year agreement. Often, you can negotiate an option to extend the agreement at the end of the lease. Usually, the land is leased per square metre. Some will charge you for just the hangar space while others will add a “buffer zone” of 10-15 metres outside of the perimeter of your aircraft hangar. Some factors to consider: lease rate, lease term, ability to extend lease, right location to erect your aircraft hangar, drainage compliance, access to runways and taxi lanes. Obviously, if you are looking for a small hangar for a small plane or helicopter on your own land, there aren’t a lot of considerations. You are pretty much looking at figuring out how big you want the hangar, what kind of quality you want and what local regulations are relevant to your building. To us, the first and biggest consideration is whether to go with traditional construction, which costs a lot of money and takes a lot of time, or commercial shed construction, which costs a lot less and is much quicker—we are going to recommend calling us at Action Sheds Australia. We can easily and painlessly custom design an aircraft hangar that suits your needs perfectly. If you need something as basic as a shed large enough for a helicopter that has one sliding door, we will be happy to provide it for you. If you want other options such as remote motorised doors, mezzanine floors for office or storage space, or separate stalls for separate hangars under the same roof, we can provide that for you, too. Our aircraft hangars, like all of our products, are ShedSafe certified and have a 15 year cladding warranty with a 10 year structural warranty. All are custom-designed and delivered to your location. Call Action Sheds Australia today: 1300 778 628. We can provide you with high quality aircraft hangars, storage sheds and other structures.